Today's guest, Sarvenaz Tash, was born in Tehran, Iran and grew up on Long Island, NY. She received her BFA in Film and Television from New York University’s Tisch School of the Arts. Sarvenaz currently lives in Brooklyn, NY where all the streets are laid out in a delightfully simple grid system. 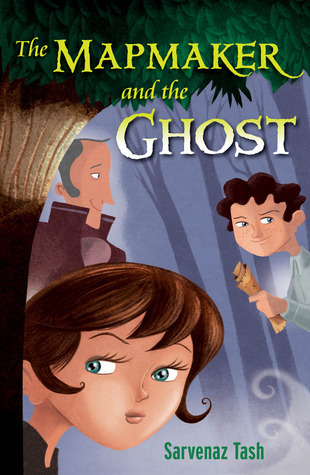 Her book, The Mapmaker and the Ghost came out from Bloomsbury/Walker. Find her on her website, on Twitter, or on her blog. I’m always a little hesitant to talk about my “writer journey,” mainly because I’m not sure where the line is between interesting/informative and boring/stop talking about yourself! I will say this, the writer journey and the author journey have one big thing in common: there is a lot of waiting involved. A LOT. I really think more than anyone who’s not in the publishing business can possibly understand (“Wait, when does your book come out?” is probably my #1 FAQ as a soon-to-be-published author). 20% Talent/Natural Affinity: I’ve wanted to be a writer since I was 7 years old and I’ve been doing it since then too. Obviously, it’s something I love to do and have a passion and a knack for. 30% Luck: I met my agent because she was teaching a children’s writing class I was taking (this was before she was an agent). That was luck. When she took me on, she shopped around a different manuscript that didn’t sell, although one editor liked my blog enough to ask if I had anything more similar (read: funnier) to that. It was luck that I even had a blog (which was about how ridiculous Times Square was because my office was in that area). It was luck that she saw something in my voice to edit my way-too-short manuscript with me on spec. 50% Hard Work/Determination/Perseverance: I’d come home from my 50+-hour work week and I’d write. I quit one day job—because it was getting too intense to let me write—for another. I still came home and wrote. I took classes, I got critiqued. I rewrote everything I wrote. My debut book has 26 drafts. I queried and got rejected, rejected, and rejected. I still wrote. It’s true that I’m not telling the whole story. In between the writing and the rewriting and the rejections, there was sometimes crying. There was sometimes exhaustion. And there were often times where I wondered if it wouldn’t be better for my mental well-being if I didn’t just quit the writing and put my entire focus on my office job. So that when I was done at the office, I could come home and relax, or hang out with friends, or watch TV. I tried this for about a year. It didn’t work. It didn’t work for two reasons: one, no matter how hard I tried, stories and characters and bits of dialogue kept swirling around in my head. They were just there and they were begging me to write them. Two, I kept thinking about the diary I kept when I was in elementary school, the one that said, in my 7-year-old handwriting, that I wanted to be an author when I grew up (it actually said I wanted to be a children’s book author when I grew up). The thought of letting down that little girl broke my heart. So I began to write again. There is a percentage within this “hard work” percentage that goes to something else: faith. I had to believe I could succeed, really believe it. Yes, logically, they’re right. If you thought about it logically (and sometimes you will as I did—see above), you’d probably come to the same conclusion. But the opposite side of the coin is that there are some people who accomplish exactly what you want to accomplish. And you know their names. Maybe, someday, they’ll know yours. I wanted it. I went for it. I worked hard. And I believed. There’s my magic author formula right there! Love this, Sarvanez!! And that faith added in at the end (sometimes called hope) is what makes me keep at it. :D I've heard great things about your book and I wish you much success! Thanks for sharing your journey. It's inspiring! Thank you, Dana! That is a really nice thing to hear. Congratulations on the release of your novel! I loved hearing about your journey - it's such an encouragement :) I can't wait to read MAPMAKER! Encouragement is the name of the game and I'm so glad if I can provide it in any way. Oh, my! When you said you couldn't let down your seven-year-old self I teared up! Very true in your percentages. It's not all of any one thing that brings success. Thanks for sharing! Thanks for sharing Sarvanez.It's good to know how much hard work and willingness to revise can help though I agree luck has a part in it all. Good luck with your book. Can't wait to read it. I loved this post! Very inspirational! Now THAT'S a magic formula I can wrap my head around.